To understand the process of email delivery, read the following tip that explains email settings, SMTP communication, and the standard email infrastructure. who use email clients have probably heard of SMTP servers and POP3 servers. 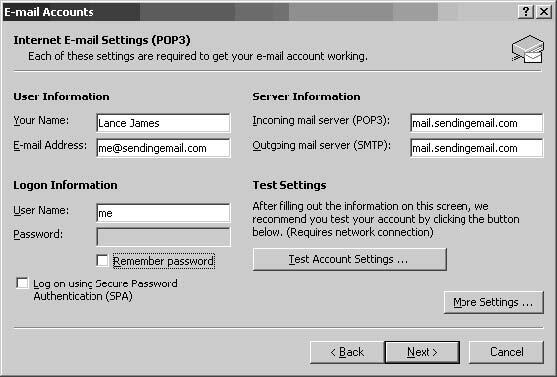 Within your email client you are asked to put in your email settings related to these servers, as shown in Figure 3. You are reading tip #2 from "10 tips in 10 minutes: Phishing exposed," excerpted from Chapter 3 of the book Phishing Exposed, published by Syngress Publishing. Phishers take advantage of these settings to successfully perform social engineering against the average email user. To understand this concept a bit more, let's take a quick review of the email protocol. Within the typical setup for email, two ports are typically used: port 25, and port 110. 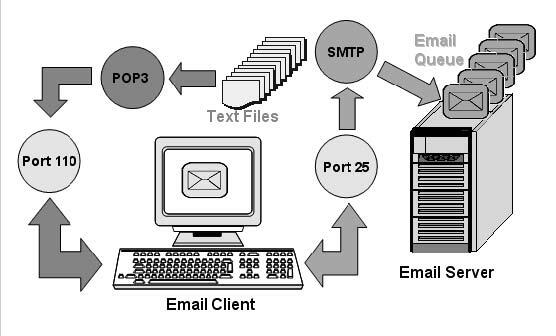 Port 25 is the Simple Mail Transfer Protocol (SMTP), and its job is to transmit and receive mail—basically what is called a Mail Transfer Agent, or MTA. An MTA is comparable to the mail carrier who picks up the mail and sends it off to where it needs to go. Just as the mail carrier drops off and picks up mail, so does the MTA. Port 110 is the Post Office Protocol, version 3 (POP3), and it is essentially the mailbox from which users pick up their mail up. This has an authentication process that allows users to log in and retrieve their email, which, in most cases, depending on your settings, is set to delete the mail from the server once you have completely retrieved it. We have successfully established a session with the SMTP or ESMTP (Extended STMP) server, and it has given us a return code of 220. We can now send it commands. The commands typically used to send email are HELO, MAIL FROM, RCTP TO, DATA, and QUIT. Basically, five primary commands control the majority of the protocol. As you can see, the server greeted us back and identified us by displaying our IP address. Technically, we could make up anything describing who we are; most SMTP servers will allow that because they know our IP, and it will mark our IP within the Received headers. This code states that the inputs we've entered are okay. In the real world, we would be rejected for the RCTP TO: from Telnet, since relaying to another network should be denied. But since we're on our own network and run our own mail server locally, this is allowed. Note that this is a quick and easy way to forge headers right at the MAIL FROM: and RCPT TO: fields. From our local network, we can put anything we want in both those fields and it will be accepted. This is one basis for some forgery; the other is the open relays, which we will get to shortly. Note that the 250 return code revealed an ID for our message; this is the message ID we see in the headers on the way out. Once we tell the mail server QUIT, it will send our message. This is the internal protocol that SMTP works with. As you can see, it's simple and flexible, which is the exact reason the technology enables so many problems while also offering convenience. The mail server infrastructure works in such an efficient fashion that we did not use only four servers but, at minimum, eight servers to deliver our email. In the process of sending email, we query multiple DNS servers to obtain information about where the mail servers are on the Internet. Create the email, specifying the From, To, Subject, and content. After you click Send, the mail client will access the DNS server of your ISP to locate your local mail server. The local mail server (mail.sendingemail.com in our example) receives your email and uses the local DNS to determine who sent it by doing a reverse IP lookup of Sender. After verification, the local mail server adds the headers and relays the mail to the mail.receivingemail.com mail server. To do this, mail.sendingemail.com has to look up what is called a mail exchange, or MX, record within DNS. This MX says, "Hello mail.sendingemail.com, mail.receivingemail.com is handling mail for receivingemail.com." Once that has been identified by our mail server, it can relay to the proper mail server. Once mail.receivingemail.com receives the email, it applies more header information, including routing data and receiving time; checks the DNS server for a reverse lookup regarding mail.sendingemail.com; and looks up the user you for the domain it is handling mail for. Client email user Receiver contacts mail.receivingemail.com (again, local DNS is used), makes a request to the POP3 port (110), and asks to retrieve its email. The email is delivered to the email client, and Receiver happily reads the email. This chapter excerpt from Phishing Exposed, Lance James, is printed with permission from Syngress Publishing, Copyright 2005. Click here for the chapter download.